I'd "visited" Fiji more ― but seen less of it ― than any Pacific country. I'd landed at Nadi eight times but for overnight transits from the hub. Finally, I got a chance to see a bit more of the large, main island. • Fiji is Oceania's most populated country (900,000). • Fiji's land mass is a bit larger that Hawaii. • Commercially developed Fiji is Oceania's second richest country, behind Palau (GDP-PPP; IMF 2015). The highlight of our condensed travels in Fiji was visiting a village on eastern Viti Levu. The welcoming phase of the visit began with a kava ceremony. Kava is a foul, bitter-tasting drink, but seems to have a mild, mellow, relaxing effect. Some people become addicted, not unlike me with espresso. Following the kava ritual was music and dance. Perhaps the man dancing on the right is in slightly better shape than the man on the left? The "Garden of the Sleeping Giant" displays endless varieties of orchids, along with lily ponds and other horticultural treats. A wonderful way to relax without needing to drink kava. Since one (affectionate?) term for environmentalists is "tree-huggers,"
I got a kick out of this at the orchid garden. Starting in the late 1800s, the British brought thousands of indentured Indian laborers to work on sugar plantations. Today about 4 out of 10 citizens of Fiji are "Indo-Fijians" and with their religious (largely Hindu), language, ethnic and other differences, along with their economic prowess, they have sometimes clashed for political power with indigenous (Christian) Fijians. We visited the characteristically colorful Sri Siva Subramaniya temple in Nadi. Here is a photo of a young apprentice sahu at the temple. 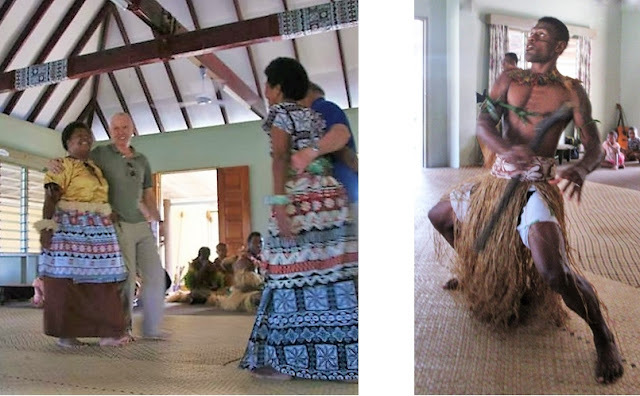 I enjoyed our swing around eastern Viti Levu island to get glimpses of traditional cultures. It was much more interesting to me than confining myself to sand and surf at a nice resort with no more than a little local dance show during a hotel dinner.